Also featuring: Sleigh Bells, Girl Talk, Beach House, Atmosphere, The Head and the Heart, Andrew Bird, Clutch, Flying Lotus, Galactic, Neko Case and more. Full lineup below. 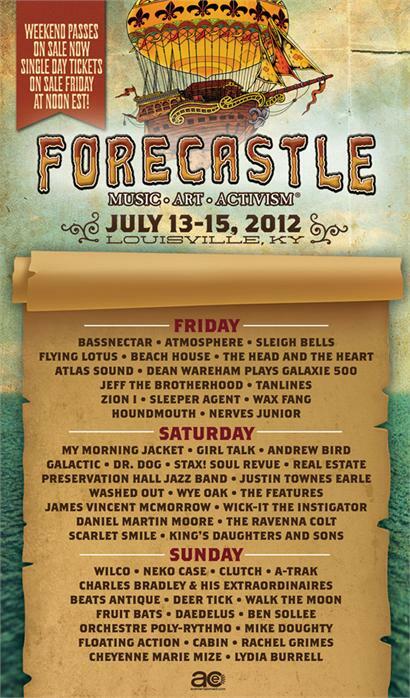 We are thrilled to announce the lineup for the 10th Anniversary of the Forecastle Festival, July 13-15 in Louisville’s scenic, award-winning Waterfront Park. My Morning Jacket, Wilco and Bassnectar are among the 70+ acts that will whip up some glorious noise at five different stages. Details for the separately ticketed, late-night after parties, set to take place at venues including the historical Belle of Louisville steamboat, as well as additional artists, art installations, environmental and sustainability activities, outdoor extreme sports park, festival partners, culinary options and other activities will be announced in the coming weeks.